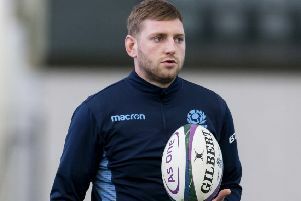 Former Scotland captain Gordon Bulloch will today set off to scale his own Mount Everest in the latest show of support for Doddie Weir’s campaign to find a cure for motor neurone disease (MND). Bulloch, who won 75 caps, has gone on to forge a successful career in business and, having started his early Scotland Tests alongside Weir, he decided to combine a desire to stay fit with a unique fundraising effort to show his support. From 7pm tonight Bulloch will attempt to scale the height of Mount Everest inside 72 hours, by running up the 427-metre high Dumgoyne Hill 24 times before Sunday evening – with a few route variations to achieve the Everest height of 8848 metres. Dumgoyne is an old volcanic plug on the western edge of the Campsie Fells, and is known for its stunning views to the south and Loch Lomond and highlands to the north. The Dumgoyne Charity Challenge has received support from the nearby Glengoyne Distillery and the Calcutta Cup will also make an appearance at the top of Dumgoyne on Sunday afternoon. Bulloch said: “It would be great to see lots of people out this weekend. It’s a glorious part of the world and I think I’ll need some support come Sunday! But I will do it. I watched Doddie play for Scotland from the Murrayfield terraces and then had the honour of playing alongside him during my early international career, and this is my little bit in helping him and his foundation. Meanwhile, the charity founded by Weir has donated £100,000 to support people with MND. The 47-year-old announced his diagnosis last year to raise awareness of the degenerative condition and pledged to devote his time to helping with research and supporting fellow sufferers. On Global MND Awareness Day, Weir donated £100,000 to MND Scotland’s grant scheme which helps people with the illness adapt their home, buy equipment or enjoy a family holiday.